A wealthy merchant and manufacturer, Thomas Bell of Belmont and Rossie, Forgandenny, succeeded to an already established business developed by his father. As a merchant, flax spinner and manufacturer, he long held a leading role in Dundee for 50 years. Having been educated in Dundee and having received 'the best education the town could supply him - more particularly for a mercantile career,' Thomas Bell began his working life in his teens as a shipowner (operating from Shore). He then entered into a mercantile career at a very young age, being well known among the merchants before he was 20 years of age. 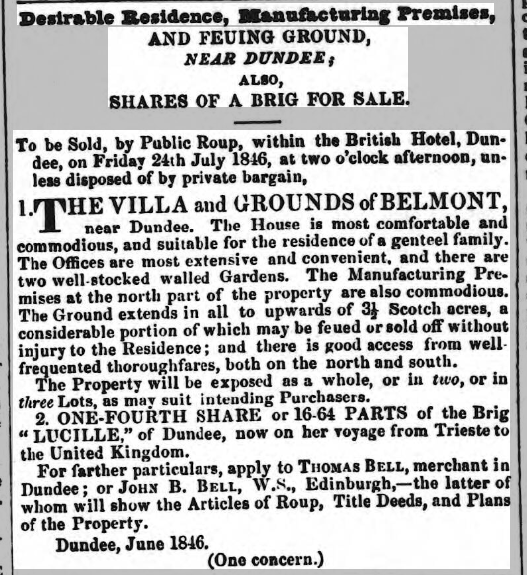 The business in which his father was a partner (Bell & Balfour, merchants) was also based at the Shore (from as early as 1809 as indicated in the Dundee Postal Directory of that year). By the end of the 1820s, Thomas had entered into business, together with his father, firstly as shipowners and merchants, latterly becoming merchants and manufacturers. He was described as having been 'the energetic power of his father's business.' By 1833, the Bells began the manufacture, at Belmont Works, of wide canvas for floorcloth. 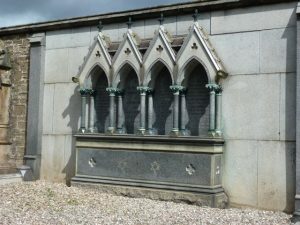 After the death of his father in 1844, Thomas was joined in the continuation of the business, by his younger brother William, at the Belmont factory. Thomas Bell was born the third son of Thomas Bell (senior) of ‘Belmont’ and his wife, Grace Brown. 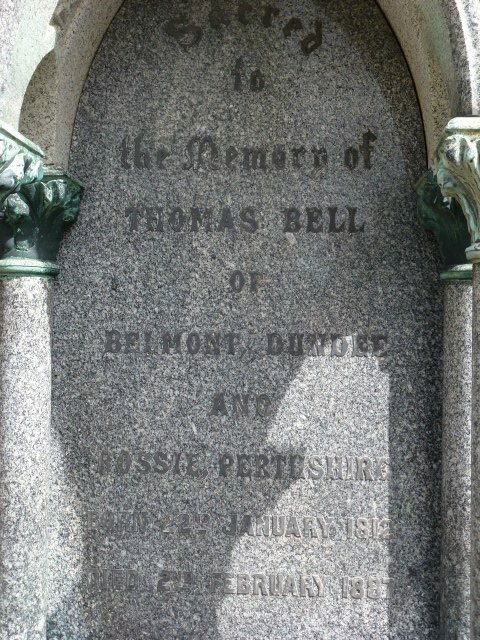 Thomas (senior) was a partner in the firm of ‘Bell & Balfour’ (merchants, Shore, Dundee). From 1821, ‘Bell & Balfour’ also operated the ‘Chapelshade Mill’ in what became known as Bell Street. Chapelshade Works had previously been a cotton mill at the beginning of the 1790s, which had attempted, unsuccessfully, to use flax and, thereafter, ceased to operate. 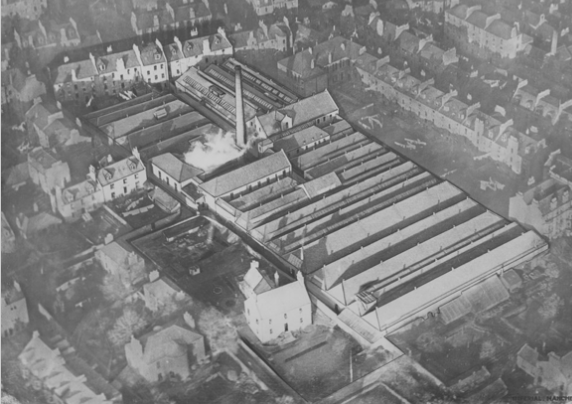 By 1821, when the demand for yarns became brisk, new spinning mills were built and before the close of 1822 there were no less than 17 mills in Dundee. The mill at Chapelshade came back into operation, worked by ‘Bell & Balfour.’ Reportedly, this new mill was given management advice by William Brown, one of Thomas Bell’s contemporaries and also his brother in law. William and his brother James were successful flax spinners in Brown Street and Guthrie Street. William Brown issued, in a letter dated 9 April 1822, a very comprehensive viewpoint towards improvements to the management of the works at Chapelshade, not least of which was to be the replacement of an inadequate manager. This advice was heeded by Thomas and his partner, Alexander Balfour. An additional observation made by William regarded the fact that ‘the spinning business with you being but a secondary business, it can scarcely be expected to turn out so well in every respect as if it were the principal.’  Notwithstanding William’s observation, ‘Bell & Balfour’ continued successfully for the following decade, operating Chapelshade Mill, together with their mercantile operations at the Shore. By the latter half of the 1820s, with Thomas now holding the post as Provost of Dundee (from 1828-31), the firm continued for a few more years. His partner, Alexander Balfour, succeeded him as Provost. By 1832, the firm was credited as being the first mill to spin jute by machine – quite a coup. 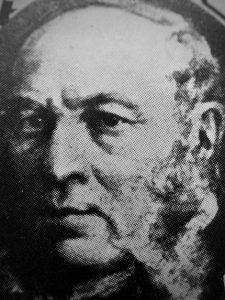 Thomas Bell (junior) already a shipowner, having embarked on a career as an export merchant, built a large continental and foreign trade. The brigs ‘Diadem’ and ‘Lucille’ were among his vessels. He would, doubtless, also have had opportunity through both his father’s and uncles’ businesses, to glean an insight into the business of flaxspinning and manufacture. This would stand him in good stead for the following fifty years. Thomas Bell (senior) died in 1844. 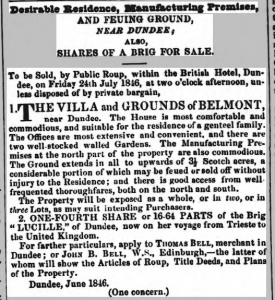 In 1846, an advert was placed for the sale of ‘Belmont House’ the family home and in which grounds ‘Belmont Works’ stood. 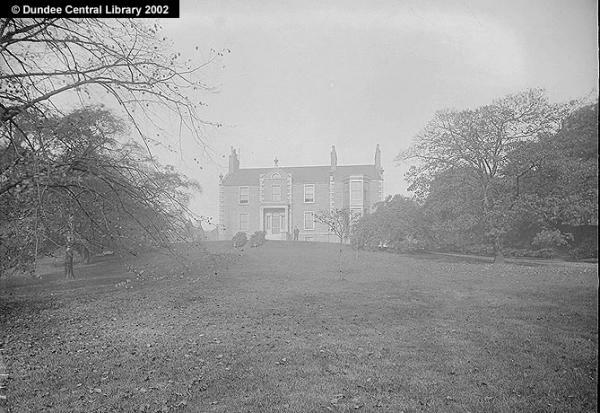 Also for sale was the quarter share Thomas (senior) held in the brig ‘Lucille.’ However, ‘Belmont House’ would appear to have remained with the family as, in 1850-54, Thomas’ (junior) brothers James Henderson Bell and Alexander Bell (of Messrs J H & A Bell) were listed as living there, before Thomas himself made that his permanent residence. The 1850s was productive both at work and at home, Thomas and Abigail having established a family of 7 between 1848 and 1859. In 1871, Thomas Bell of Belmont collaborated with Joseph Lindsay of the firm Urquhart, Lindsay & Co, to patent a new model of power-loom, designed specifically for eight-yard cloth – the basis of floor cloth which was wider than the norm. Although Thomas Bell was heavily involved in manufacture, he found time to hold a ‘lively interest in many philanthropic institutions of the town’ and was also one of the original subscribers to the High School. He must also have had foresight and drive enough to have become involved in speculative ventures – he having been ‘the originator and also a Director for some years in several American Investment companies which proved extremely successful’ and also lucrative. Declared to have been a shrewd operator with great integrity and stainless honour, Thomas continued to prosper and raised himself to a leading position in commercial circles. Just as he had benefited from the marriage of his father into the family of successful flax spinners, James, William and Andrew Brown, so the links were to continue with the marriage of his son Thomas marrying into the family of John Sharp, also a major manufacturer. 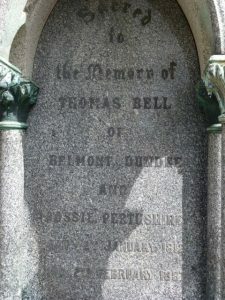 Thomas Bell died in 1887. His funeral procession from ‘Belmont House’ to the Western Cemetery was made by 36 carriages, with the route lined by well wishers. The works stopped at lunchtime as a mark of respect. His 6 sons were pall bearers. Thomas’ manufacturing business, begun by his father, further developed by him, was continued by succeeding generations at ‘Belmont Works’ and ‘Heathfield Works.’ Ultimately, it was amalgamated into Sidlaw Industries, continuing into the 20th century. Dundee Postal Directory, 1850. p.76. Dundee Central Library, Local Studies. Dundee Postal Directory, 1853-54. p.136. Dundee Central Library, Local Studies. 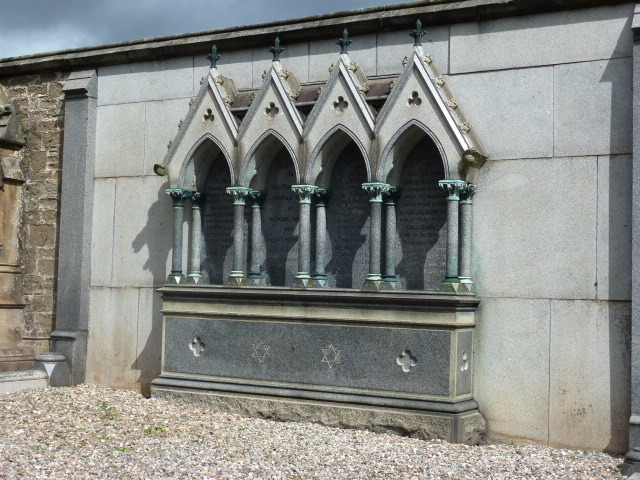 Western Cemetery Plots, Friends of Dundee City Archives website. Dundee Postal directory, 1809. p.40. Dundee Central Library, Local Studies. Dundee Postal Directory, 1818. p.16. Dundee Central Library, Local Studies. Watson, Mark. Jute and Flax Mills in Dundee. (1990) Tayport. Hutton Press Ltd.
Carmichael, Peter. (ed. Enid Gauldie). The Dundee Textile Industry, 1790-1885. p.17. Scottish History Society (1969). Edinburgh. T and A Constable Ltd.
Brown, W. (ed. John Hume) Early Days in a Dundee Mill 1819-23. Dundee Abertay Historical Publications. No 20. (1980). p.37-43. List of Provosts of Dundee, Friends of Dundee City Archives website. Sidlaw Industries. (1887-1942). GB 254 MS 66/ 1. University of Dundee Archives. Lenman, Lythe and Gauldie. Dundee and its Textile Industry 1850-1914. Dundee Abertay Historical Society Publications. No.14. (1969). p.49. Dundee Courier, 8 February 1887. p.2. Findmypast website. The information above about Thomas Bell has been collated from a range of digital and hard copy sources. To the best of our knowledge it is correct but if you are relying on any information from our website for the purpose of your own research we would advise you to follow up the sources to your own satisfaction. If you are aware of an inaccuracy in our text please do not hesitate to notify us through our Contact page.